The biggest GT Race in the world! 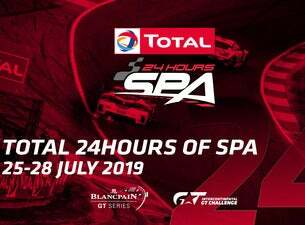 The 2019 edition of the Total 24 Hours of Spa promises to be bigger and better than ever. The highlight of both the Blancpain GT Series and Intercontinental GT Challenge seasons, the legendary endurance contest traces its history back to 1924 and is today the most popular event on the Belgian racing calendar. Continuing the success that has characterised recent years, 2019 will see upwards of 60 high-spec GT cars battling for one of the most sought-after trophies in motorsport, with the world’s top drivers at the wheel. They will represent a roll call of prestigious automotive manufacturers: Aston Martin, Audi, Bentley, BMW, Ferrari, Honda, Lamborghini, Lexus, McLaren, Mercedes-AMG, Nissan and Porsche. The 2018 edition concluded with six different brands among the top-10, setting a new record for the current GT3 era. But the Total 24 Hours of Spa is not merely a spectacular race: there is just as much entertainment to enjoy off the circuit. There are attractions to please the whole family at the Total 24 Hours of Spa Village, while the hugely popular music concert on Saturday evening will ensure there really is something for everyone. Children under 12 accompanied by an adult will enjoy FREE access to the event, except for VIP packages.